As part of traditional rites at Shuumbwa’s traditional homestead in the Onambango village this morning, every one present at the ceremony is given to drink a cup of traditional homebrew “malovu”. The lady sitting nearest to the new king is Martha Namupala and she was the one who anointed the new king on behalf of the king’s father. Even though the royal family is matrilineal, the anointing is done by the father’s family and that is what happened here. 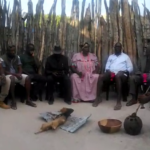 Meanwhile it emerged that a faction of the royal clan appointed Konisa Kalenga as the new king. Kalenga is Shuumbwa’s uncle.